Another of the BFI series on film classics. 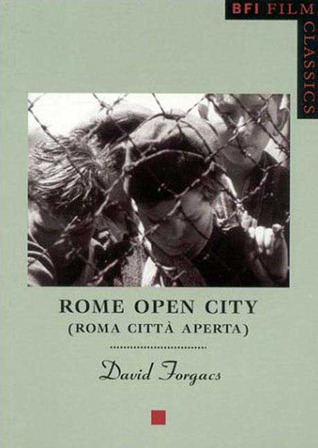 Rossellini's Rome Open City was produced the year after the liberation of Rome, and presents a view of the city under the German Occupation at the beginning of 1944. Rossellini went on to be one of the founders of the school of filmmaking called "neo-realism" and this is often considered the first "neo-realist" film, although the author of this study prefers to call it a transitional work, which does not have all the features of the style. The book considers briefly the way in which the film was produced, describes the plot and some of the actual events it was based on, and discusses it in relation to the political situation of the time, etc. There is much of interest here in a very short book. My only quibble is that the organization could have been better. I watched this film again on Youtube before reading the book. If you haven't seen Rome Open City, yet, you gotta, you just gotta. All Italy came together to make it, the director teamed up with a whole bunch of Cinecitta people (Fellini, Pasolini, Anna Magnani) to contribute to it. Rossellini sold pretty much everything he owned to pay for the celluloid to shoot the film, which was made during the Nazi occupation and takes raw, broad swipes at the Germans indeed while anyone who might have caught wind of its production might likely have been shot on sight. Good on the historical context of the film.